There have been a number of mini-features added to MO71 over the last few months. We have mentioned a few in passing in our monthly newsletter, but it’s time to take a look at them in a little more detail. Some dialog lists, I’m thinking channels and queue managers specifically, have large numbers of fields and it can be hard to find the particular field you are looking for in order to change the columns shown in the list dialog. Both lists in the “Alter List” dialog now have a search field below them to allow you to filter the list and find what you are looking for. Staying with the “Alter List” dialog, another change is that you can now select multiple fields to move up and down in the list at once instead of having to move one field at a time. You have the flexibility to make your MO71 List Dialogs look exactly how you need them to look with ease. MO71 will now remember the dialog positions and sizes for a 1, 2 or 3 monitor set-up. 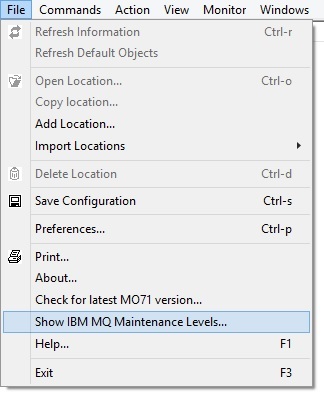 MO71 supports the newest command levels provided by IBM MQ. See What’s in Command Levels 91x for details. 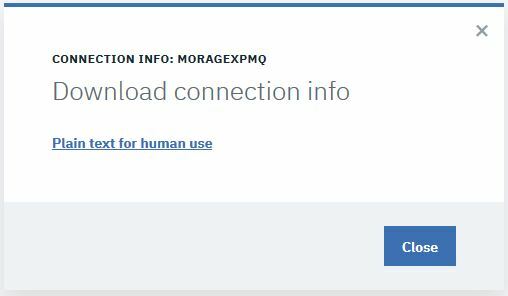 You can now configure MO71 to make HTTP connections via an HTTP Proxy. 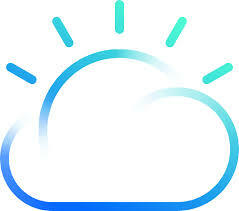 This might be necessary for retrieving latest versions of IBM MQ or the latest versions of MO71 from your work location. 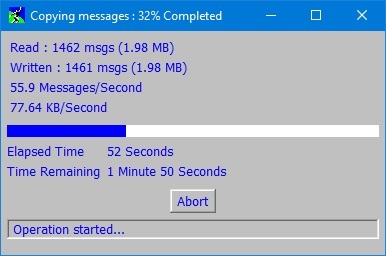 MO71 will now report on its progress as it is moving, copying or deleting large numbers of messages. You will see these only when your action takes longer than 3 seconds (by default), from both the message list dialog and the QLOAD dialog. Most MQ string fields, whether object names or attributes, are not allowed to start with a blank and trailing spaces are insignificant. The queue manager will let you know with an error if you try to have spaces at the beginning. There are one or two fields, such as exit data attributes that allow them, but mainly MO71 would strip leading and trailing spaces before sending to the command server. The topic string attribute is different from many MQ string attributes in that it is legitimate to have leading and/or trailing spaces, and those spaces are significant. A topic string that only differs due to a leading or trailing space from another is a valid and different point in the topic tree. MO71 allows you to have these leading and/or trailing spaces because if it didn’t you could not look at topic strings that had them, but it also warns you if you try to create one with a leading or trailing space because in all likelihood you did not intend to. In addition, the problems that MO71 attempts to detect if you run a health check against your queue manager will report any topic strings that contain leading or trailing spaces. If you deliberately have topics that use such a pattern, you can remove these from the list of problems that are detected. Do you have any topics lurking with extra spaces? 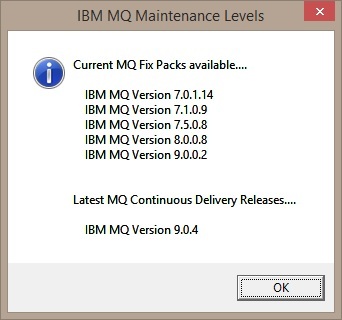 The newest version of MO71 is able to check what the latest available maintenance level of IBM MQ and inform you if you are back level. In its simplest form this comes as a file menu option which you can manually select at any time. 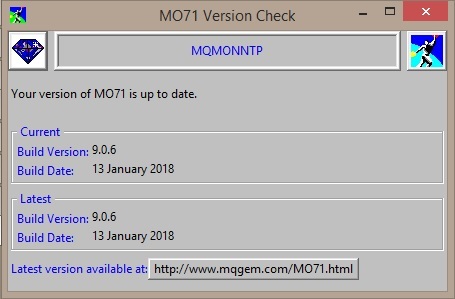 However there is also an option to have MO71 check for new versions automatically to save you having to remember to do it, and to pop up a reminder to you if there is a new maintenance level. In addition, if you run a HealthCheck on your queue managers, one of the problems that can be checked for is whether your queue manager is running at the latest maintenance. And finally if you look at a multi-queue manager list of queue manager attributes, there is a new column that can be added to this display which shows the latest maintenance applicable to the version each queue manager is using. If a queue manager is up-to-date on maintenance then this field is blank. 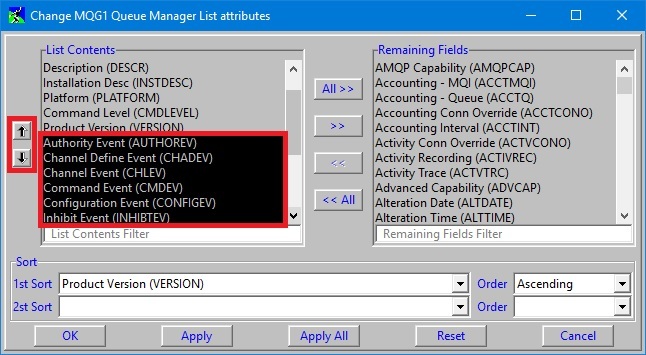 Therefore, a simple filter showing only those rows with something in that field can immediately show you which queue managers need maintenance applied, or you can make a simple filter to highlight the queue managers that have a newer MQ maintenance level available, by changing their background colour, as shown below. Following on from version 9.0.5, when column filters were first introduced, this version improves them for integer values which are now shown as a selectable list of values in use. 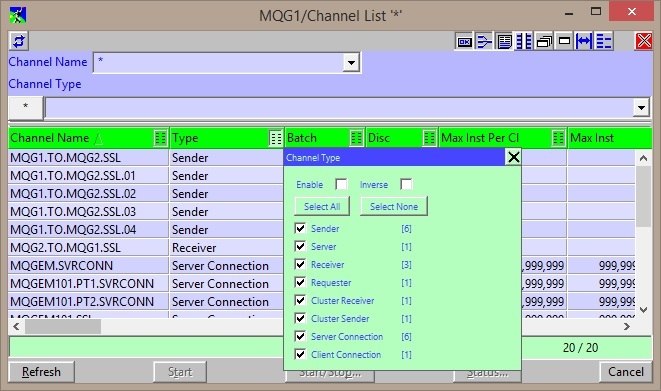 You can configure MO71 to display a panel of information either when MO71 initially starts or when a user connects to a Queue Manager. This allows a central MQ Administration department to disseminate information to MO71 users. For example, tell them about Queue Manager ownership, status or maintenance schedules. 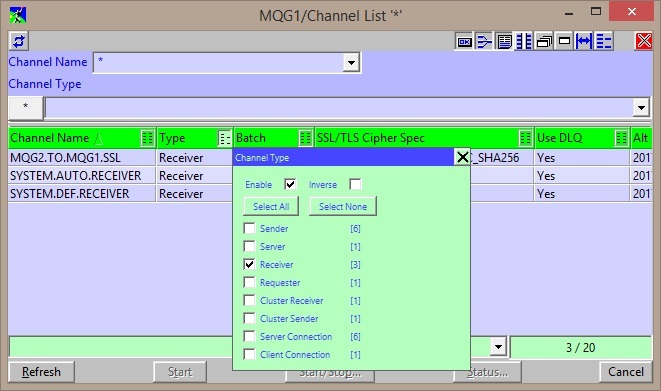 MO71 can now check and notify you if there is a later version of MO71 available for you. You can now import location definitions from another, central, MO71 configuration file. Not only that but you can ask MO71 to merge any definitions from this file into the local configuration each time it starts. Another feature which makes central administration a little easier. You can configure MO71 to run a command if the licence file is either not present or due to expire soon. This enables you to automatically copy or FTP a new licence file from a central location without the end user needing to do anything. MO71 utilises the MQCNO_ACTIVITY_TRACE_DISABLED option so that while using it to view activity trace records, you are not also generating even more! This is of course, only honoured if the queue manager allows it which is controlled by the queue manager attribute ACTVCONO. So in addition, the MO71 Activity trace viewer also has some quick check boxes to hide from view all its records should they be generated. What if you want to see the activity trace for MO71 though? For example if you want to trace the API Exerciser? There are two ways to over-ride the use of MQCNO_ACTIVITY_TRACE_DISABLED. One is to use the following command (which applies the over-ride to all applications that have specified it). The other is to add a stanza like the following to your queue manager’s mqat.ini file. 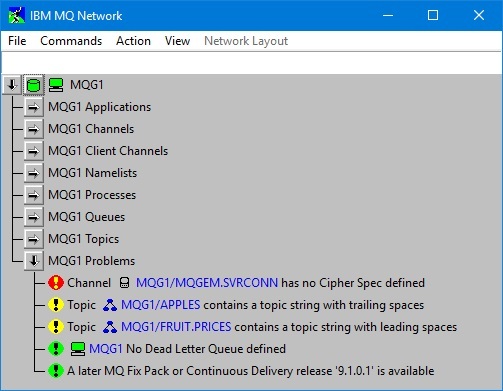 Remember if MO71 is already connected, you can make an alteration to the queue manager object to get it to pick up the new mqat.ini file or just disconnect and reconnect to the queue manager to pick it up. Now looking at the Activity Trace window, on the “Settings” tab, uncheck “Exclude this process” so you can see records from this process ID, and also “Exclude MO71 processes” which just causes the filtering for the “Output” tab to hide any records that come from any “mqmonntp.exe”. Remember to press Apply Settings once you’ve made these and any other filtering changes. Note: With these two check boxes, you could run one instance of MO71 to view the Activity Trace records, and a second instance of MO71 doing the activity you want to trace, for example using the API Exerciser, then you could leave “Exclude this process” checked and only uncheck “Exclude MO71 processes”. It may also be wise to turn off any automatic operations that are being done by MO71, such as exporting objects on a scheduled time interval, which would generate a lot of activity from MO71 in the trace. 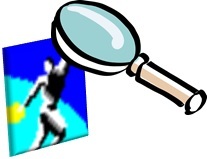 Other resources that you may find useful about Activity Tracing. MO71 is our graphical administration tool for IBM MQ. 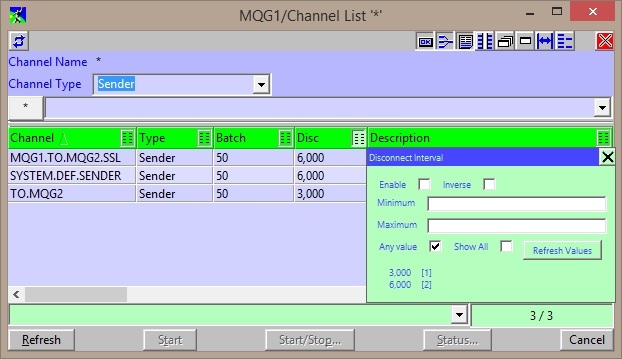 You can manage all the different object types in MQ using its lists and object dialogs. The lists are fully flexible allowing you to determine which fields are interesting to you and which are not and choosing only to display those columns in the list as a result. You can make these changes temporarily, just to the instance of the dialog you are currently using. You can make them more permanently, so that every time you bring up that list on that queue manager, you have the same columns. Or finally, you can make these changes across all your queue managers, because the columns you want are the ones you think should be the default set. You can also change the columns in a dynamic manner using filters. This post will cover these various different mechanisms. When looking at a list of objects you can change the columns that are displayed by selecting the Options -> Alter List… item from the context menu. This will bring up a dialog where you can locate the additional columns you want to display. So I’ve got a list of queues, with some cluster queues and I want to see the Cluster Queue Manager that hosts the cluster queues, so I locate the field Cluster Queue Manager Name (CLUSQMGR) in the right hand side of the window in the list of “Remaining Fields”, and move it to the “List Contents” by pressing the << button. Then I can move its position in the columns on the left hand side using the up and down buttons, and press OK to complete the change. Now you’ll see that your queue list has the additional column you selected. However, if you close the queue list dialog, and later open another queue list dialog, you’ll see that your alteration to the list of fields shown has been forgotten, it was a temporary change that you made. Following exactly the same process as above, with one small change, you can make the change permanent for that queue manager. On the dialog which allows you to change the columns shown, instead of just pressing OK to make the change, first press Apply All which applies the change to all instances of that particular list dialog for this queue manager, both those currently open, and any future invocations of that list dialog. This change is also remembered across a restart of the MO71 program. In essence, this mechanism is changing the defaults for list dialogs. 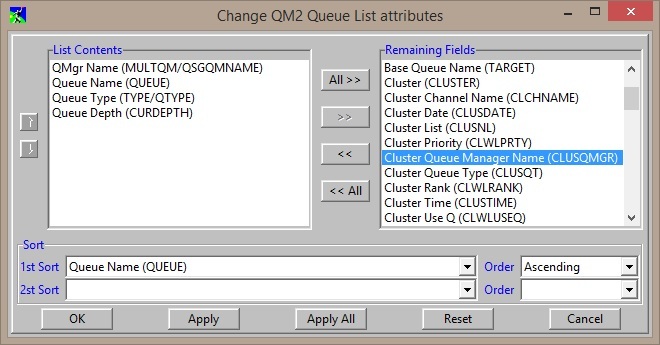 If you add a new queue manager to MO71, it will pick up the default columns too. Using the menu option View -> Set Default Lists -> Queue List… (or whichever list dialog you want to change), you will be presented with a very similar dialog to the one above, except instead of referring to a single queue manager in the window title, it will indicate that it is a “global” list. 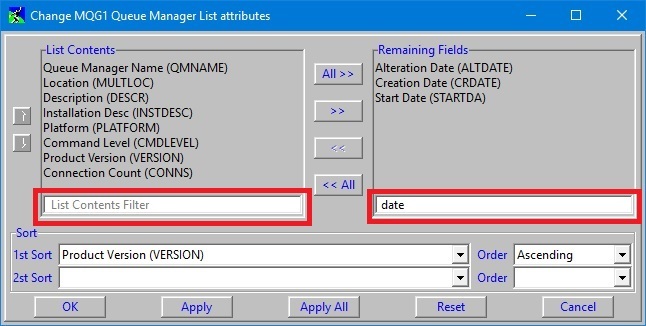 Pressing OK or Apply on the global change list dialog will set the new default and all queue managers that have not had their list changed by the above mechanisms will pick up these new defaults. Pressing Apply All on this dialog will set all queue managers to use this list instead of anything that may have previously been altered by the above mechanisms. Because this is a ‘destructive’ setting (i.e. you lose previous set up you might have done), there is a confirmation dialog for this change. This change is also remembered across a restart of the MO71 program. You can also change the column display from within a filter. This can particularly useful when creating pre-defined dialogs. Especially if you want to have several different ‘default’ sets of columns. This can be done in two ways. Firstly by adding a ‘#’ character after a keyword or user variable name, to show it as a column on the end of the display. The example below has a filter which creates a user variable called “Fullness” and as a result of the ‘#’ character on the end, also displays that as a column. The other way to manipulate columns from within a filter is to use the showcol and hidecol functions. This is very useful in a pre-defined dialog, allowing you to change the default set of columns to exactly what you need for this dialog. You might, for example, have several different queue lists, one for cluster queues, one for transmission queues, and one for dead-letter queues across all your queue managers. You can imagine wanting slightly different columns on display for each one. The showcol function takes the MQSC spelling of the keyword and the column position, and the hidecol function just takes the keyword. Heopfully now you can have exactly the columns you want on display in any list you are viewing. If you have any questions please leave a comment below, or get in touch. If you don’t have a licence and would like to try out MO71 then send an email to support@mqgem.com and a 1-month trial licence will be sent to you. This release was created for one specific requested feature – Column Filters. MO71 has a very powerful filtering capability already, but with power often comes complexity and some find this daunting to learn. The introduction of column filters allows for, very easy to use, filtering by columns, to reduce the amount of data you are looking at on a list dialog. To use it, look in the column heading of a column in a list dialog, and you will see a new filter icon. Click on this icon and a filter dialog will pop-up. This dialog will look a little different depending on the type of attribute you are trying to filter. For strings, you can type in a string, or part of a string to match on; for integers you can provide a minimum and/or maximum; and for enumerated values, you can see all the possible values and select or deselect them. In the case of enumerated values, you also see a count of how many of each value there are in the current list dialog. This can be handy in itself without using any filtering! Now I can reduce the amount of data shown in my list, by deselecting the values that I am not interested in at the moment. In case you forget that you have filtered the list, and wonder where your other objects are, there are two visual clues that filtering is currently in effect. Firstly, the icon in the column heading changes to show that a filter is active, and the count of objects displayed does not match the total number available as shown in the bottom right of the window. You can filter on several columns at once in a single dialog, and so if you later want to turn them all off, you can do so with one click, using either the context menu option, Options -> Remove Column Filters, or the toolbar button for the same.